Iraqi security forces advance in military vehicles in Kirkuk, Iraq October 16, 2017. WASHINGTON - After years of focusing divided Iraq on a shared fight against the Islamic State group, the United States is now straining to leverage its limited influence to avoid a full-blown conflict between the Iraqi and Kurdish forces it has armed and trained. Experts say that a path toward reconciliation, in some form, exists. 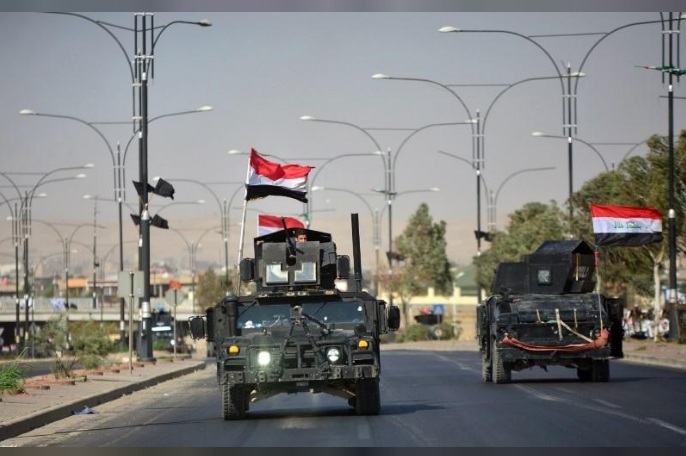 But it will be a long, arduous test of nerves that could expose the U.S.-backed war effort in Iraq to risks from insurgents and from militia backed by neighboring Iran. U.S. President Donald Trump declared on Monday that the United States was not taking sides in the internal conflict between Baghdad and independence-seeking Kurds, as Iraqi government forces captured the Kurdish-held oil city of Kirkuk. “We don’t like the fact that they’re clashing. We’re not taking sides,” Trump told reporters at the White House. “We’ve had for many years a very good relationship with the Kurds as you know and we’ve also been on the side of Iraq,” he said. That neutral approach met a cool reception from the Kurdish government representative in Washington, Bayan Sami Abdul Rahman. In particular, she said the United States had already helped isolate the Kurds by publicly calling for them to postpone the Sept. 25 referendum on independence that triggered the dispute with Baghdad. “With every step (Washington) emboldened Baghdad, Iran and Turkey ... each one of them thinking: ‘Well, so the Kurds are on their own, we can do whatever we like’,” she told Reuters. The Iraqi government’s capture of Kirkuk was the most decisive step yet by Baghdad to block the Kurd’s independence bid. It also put Washington in the awkward position of recognizing the Iraqi government’s authority while maintaining ties with its close Kurdish allies. U.S.-led coalition military support for Iraqi and Kurdish forces was decisive during the most critical phases of the war against Islamic State. However, Washington’s leverage has yet to be fully tested after the recapture of major cities from the militant group. It is unclear, in particular, how much influence the United States has with Kurdish leader Masoud Barzani after already failing to delay the independence referendum, in which the Kurds voted to secede. Paul Salem, from the Middle East Institute think tank in Washington, said Barzani was learning that he had “very few friends and he is a much weaker player” than he thought before the Sept. 25 vote. “(The U.S.) has some leverage,” Salem said. Michael Knights, an expert at the Washington Institute for Near East Policy, said the United States needed to take steps to avoid alienating the Kurds in the region. Those steps included sending a U.S.-led military coalition officer to a key military base there and pressing for an interim Kurdish governor of Kirkuk. “This would maintain the basic power-sharing compact negotiated by Kirkuk community leaders in 2007,” Knights said. The Pentagon confirmed that U.S. forces had a presence in the vicinity of Kirkuk but declined to say where. Such a presence could help deter further conflict, a tactic it used in Syria to keep Kurds and Turks from fighting each other. The U.S. State Department urged all sides to “restore calm” and warned that the dispute was distracting from the battle against Islamic State, which swept through Iraq in 2014 by exploiting the country’s vast ethnic and political divisions. “We strongly urge all parties to avoid provocations that can be exploited by Iraq’s enemies who are interested in fueling ethnic and sectarian conflict,” it said in a statement. Former U.S. ambassador to Iraq, James Jeffrey, said he believed Iran - which backs Shi‘ite Iraqi militia - was positioned to gain influence because of the Iraqi-Kurdish conflict. He said the United States needed to make certain that Iranian-backed forces don’t “surge forward” into the Kirkuk area to challenge Kurdish Peshmerga fighters. “The United States has to make it very clear: We are not going to defend Kirkuk ... but if the Iranian militias move forward, then we will help the Peshmerga,” if necessary, Jeffrey said. Trump unveiled last week a more aggressive U.S. approach to Iran, whose elite Islamic Revolutionary Guard Corps backs the militias in Iraq. Abdul Rahman was wary of Iran’s role in the unfolding crisis and criticized the U.S. military’s characterization of an exchange of fire early on Monday as a “misunderstanding,” downplaying the loss of life. “I think the U.S. needs to be very, very aware of the statements that it makes and the statements that it doesn’t make,” she said. The threat of Iraqi and Kurdish forces turning U.S.-supplied weapons against each other has raised alarms in Congress. Senator John McCain, the chairman of the Senate Armed Services Committee, warned Iraq’s government of “severe consequences” over any further misuse of U.S.-provided weaponry against Kurdish forces. “The United States provided equipment and training to the government of Iraq to fight (Islamic State) and secure itself from external threats - not to attack elements of one of its own regional governments,” McCain said. After years of focusing divided Iraq on a shared fight against the Islamic State group, the United States is now straining to leverage its limited influence to avoid a full-blown conflict between the Iraqi and Kurdish forces it has armed and trained.